From Goodreads – On the island of Nil, the rules are set. You have one year. Exactly 365 days–to escape, or you die. Seventeen-year-old Charley doesn’t know the rules. She doesn’t even know where she is. The last thing she remembers is blacking out, and when she wakes up, she’s lying naked in an empty rock field. Lost and alone, Charley finds no sign of other people until she meets Thad, the gorgeous leader of a clan of teenage refugees. Soon Charley learns that leaving the island is harder than she thought. So is falling in love. With Thad’s time running out, Charley realizes that to save their future, she must save him. On an island rife with dangers, their greatest threat is time. Guys, this is such a cool book. Part survival story, part romance, part adventure, it’s like Survivor set in a parallel dimension, one where escape is not guaranteed. I’ve never read a story quite like Nil, and for that reason, it took me a bit of time to fall into. The cast is large and the world is unique (both good things! ), so it took awhile to ground myself in the story. Once that happened, though, I was hooked. I read while I ate breakfast, while I dried my hair, while I was on the elliptical, and while I waited in the pick-up line at my daughter’s school. Lynne Matson is ruthless when it comes to challenging her characters, and she very successfully uses time (dwindling time, specifically) to rachet up the tension, making Nil almost impossible to put down. Charley and Thad are awesome protagonists. Charley is strong and smart and motivated, and Thad is a natural leader who’s incredibly sweet when it comes to romance. Their relationship deepened quickly, a bit of an instalove situation that might’ve bothered me in another story, but on the island of Nil, time is limited and a no regrets mindset is the way of life. Why not go after the boy/girl of your dreams? I enjoyed Nil‘s secondary characters too, particularly Natalie and Rives, and the island setting was fantastic and very well developed. 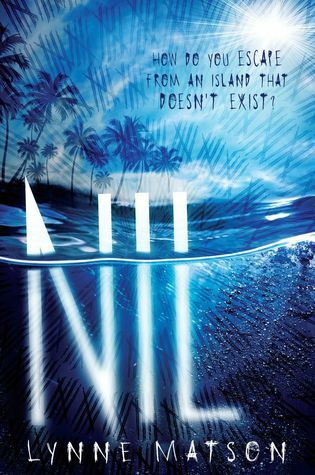 While Nil requires some suspension of disbelief, it’s a unique story of survival, sacrifice, and love, and a strong debut from Lynne Matson. Do check it out! Adding it to my TBR. Thanks, Katy! I hope you enjoy, Elodie!